Sometimes, some decisions are not easy to accept. Life might make them. Or we might make them for ourselves. In a short while, I have found myself everywhere. On and off carousels of different colors. Building relationships where the timing might not work. Others rising, phoenix-like from ashes in the ground and taking life, quickly and suddenly. My mother always says that there are no coincidences. I think she’s right. In the middle of all this, winter has been holding me in its grip. It’s February, close enough to March, with the days growing longer. I cannot help but long for the easy days of summer. With summer tomatoes, heady summer peaches and yes, tender and green summer corn. While shopping at Sobsey’s recently, I stumble upon fresh ears of corn from Florida. Maybe it’s a sign. Summer beckoning again. 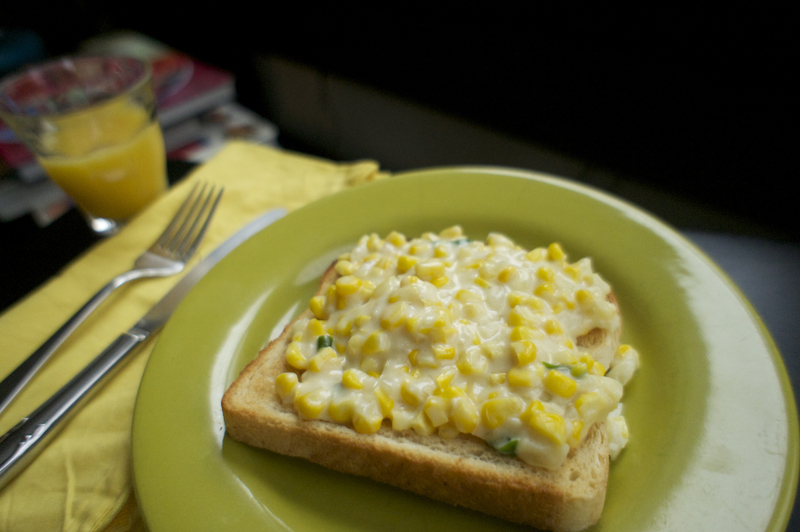 I come home and make corn toast – which brings back my childhood in Calcutta. 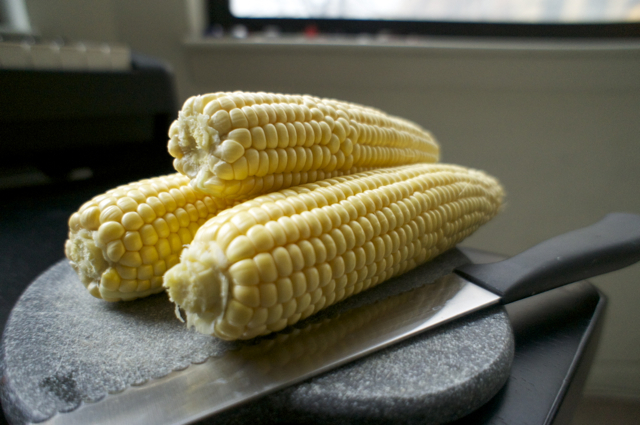 It’s fresh ears of corn sliced off the cob and pan roasted for a few minutes with a pat of butter, onions and a green bird’s eye chilli or two. A little bit of flour stirred in and then a cupful of milk that cooks for a little while to create a creamy, velvety béchamel-style sauce. Some grated aged cheddar. Served warm on crispy toast. 1. Heat the butter in a heavy bottomed pan on medium heat. When sizzling, throw in the onions and green chilli and sauté for a minute or two. Add the fresh corn kernels. Cook for a few minutes until the corn is tender and cooked through. 2. Now quickly stir in the flour, followed by the milk. Mix well to combine. 3. Let the mixture come to boil, reduce heat and allow to thicken, stirring occasionally. Turn off the heat when the sauce starts coating the sides of the pan. Remember that the sauce will thicken further on cooling. Add salt to taste and optionally, about a 1/2 cup of grated sharp cheddar cheese.